Suspense is my main genre. I think suspense/dark mysteries/crime novels reflect the basic human condition: the struggle to survive. We all relate to this struggle because, at some point, each of us face life-threatening threats in some form. CHILD’S PLAY is the story of a second grade teacher, Elle Harrison, who is about to start a new school year. One of her former students, Ty Evans, has just been released from juvenile detention where he’s served eight years for the murder of his father. Soon, people with whom Ty has grudges are brutally murdered. Ty reappears in Elle’s life, and soon she herself is attacked. She fears for her life and eventually has to confront the killer in the ultimate struggle. That’s the main plot line. 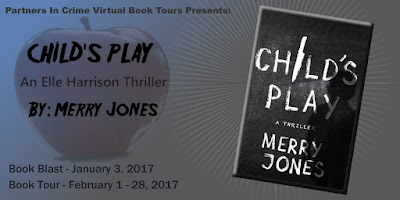 CHILD’S PLAY is a gripping read, but it’s about a lot more than the mystery. For example, it looks at Elle’s attempt to recover from loss. Elle is trying to sell the house she shared with her husband who died two years before. Even as a killer closes in, Elle is coping with saying goodbye to her home and trying to control an annoyingly aggressive real estate agent. Another theme involves Elle’s strong group of supportive women friends. This group sharply contrasts with a group of young girls composed of Elle’s former students. The importance, influence, and both positive and negative effects of female friendships play a big part in the book. 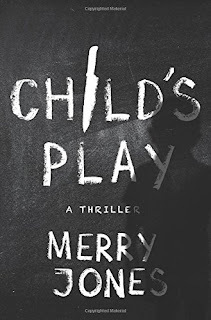 By placing murders in a school and the surrounding neighborhood, CHILD’S PLAY looks not just at murders, but also at how the murderer developed within a community and family. CHILD’S PLAY is a story of peer pressure, child abuse, juvenile justice, and the often difficult roles teachers play in the lives of their students. Oh man. SO many methods because, for me, marketing is a bigger challenge than writing the book. So I’m doing interviews like this one. And writing a bunch of guest blogs. I’ve scheduled podcast interviews and bookstore signings. I’m sending out my newsletter with a contest to win free books. There’s a Goodreads giveaway. I sent a post card promotion to hundreds of indie book stores. A Thunderclap announcement of CHILD’S PLAY’s release will reach about 400,000 people. Also, I’m speaking to groups—anywhere I can, including book clubs, conferences and bars. 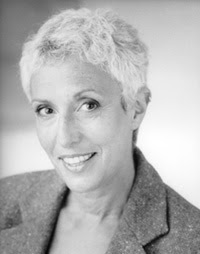 I’m participating in ITW’s author’s promotion opportunities, promoting on my website and Facebook and Twitter. Etcetera. It’s a never-ending effort. Keep writing. That’s it, really. Don’t give up. Don’t get discouraged if you get stuck or face rejections. Keep going. If you’re a writer, you have no choice. Stories are inside you, nagging you to let them out. Your characters want to come to life on paper. Your plots want to unfold. So do it. Write it. A little at a time, consistently, every day if you can. Hone your craft. Develop your voice. Keep at it. There are so many—Losing myself in the writing process so I don’t know what time it is. Or reading back something I’ve written and being surprised that I like it. Holding a copy of my published book and feeling it in my hand. But if I have to pick just one, I’d say that the best thing is connecting with readers. For me a book isn’t completely finished until it is read. I can do my part by putting the words on paper and finding a publisher. But only when somebody reads the book and reacts to it do I feel a sense of completion. Even complaints satisfy me. Because if someone complains about, say, a character or a plot twist, I know that someone has been affected enough to bother to complain. Of course I prefer praise to complaints. But I write for readers. So the best thing is learning that my work has reached them. Then I’m finally finished, and I feel a sense of accomplishment. About nine months. I’ve written some in six months to meet deadlines, and that was brutal. Nine months is intense. A year would be comfortable. Each book is different and requires different methods. Over the years, I’ve had to learn about sleep disorders, pre-Colombian religion, brain injuries, archeological digs, PTSD, human trafficking, dog fighting, drug trials for medical research—and a host of other topics. To learn about settings, I’ve traveled to upstate New York, a state forest in Pennsylvania, Israel and Mexico. I begin each book by reading up on the subject matter. 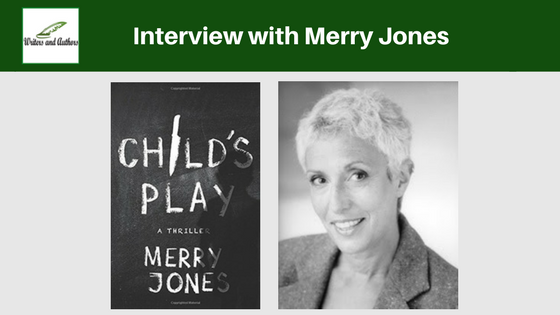 For CHILD’S PLAY, I read about child development, second grade curricula, seven-year-olds, child abuse, juvenile detention, real estate, peer pressure. When I’d made a bunch of notes from reading articles and other reliable sources, I interviewed a former prison guard, a child development expert, a psychologist and a teacher. I visited locations on the Main Line (near Philadelphia) where the book is set. In general, my research begins broad with articles on the general subject matter. Then I zero in with more specific questions, talking to experts and traveling to locations. I’m trying to write a novel in a different genre. Not suspense, but contemporary women’s fiction. After a dozen or more suspense novels, I thought I’d do something different by writing a crimeless book that focused on relationships. I made it to page 89. That’s where the first murder happens. And it’s clear that there will be more before the end. I intended to write a novel where the stakes were lower and the mood less dark. But no. My characters didn’t cooperate. One got mad and killed another. Maybe I’ll manage to go crimeless next time. I always made up stories, even as a young child. My family encouraged this. Also, my early teachers—in second and third grade. My fifth grade teacher entered a story I wrote into a national contest and I received a letter of commendation. That spurred me on. So it’s not a single “who,” but a consistent environment of encouraging people. I don’t know where the initial drive to write came from, though. It was always just there from my earliest memories. Whenever the weather permits, you’ll find me on the Schuylkill River, sculling. I love to row in my single shell or with my husband or one of my daughters in a double. Rowing is great exercise, and being on the water with the turtles, egrets, cormorants, ducks and geese is extremely peaceful. The sport requires focus, as each stroke consists of a sequence of precise movements to be performed in ever-changing conditions of water and wind. Sculling helps my concentration as well as my physical health. It revitalizes me, improves my mood, gives me a break from the demands of daily life and the worries of the world. Also, it’s fun. Other than that, I try to spend time with my family. One daughter is getting married this spring. I never imagined how much time preparations would take. And I spend a significant amount of time with the Philadephia area writing community. I co-host free writers’ coffeehouses with the Philadelphia branch of the Liars Club. And I co-host a Liars Club podcast. I participate Noir at the Bar readings whenever I can. Etcetera. We have a lot of talent in the area, and I love connecting with other writers. Fantastic interview. I found it interesting as to the research of this book especially since I read it and really enjoyed it! Thanks so much for the interview! I enjoyed thinking about your questions and appreciate your featuring CHILD'S PLAY!